Meet the muntjac — the most interesting deer in the world. It’s the size of a dog, it’s the oldest deer around, it has antlers but fights with tusks, and it even barks loudly at things that threaten it. But its most interesting quality is this — it gets by with fewer chromosomes than any other mammal on Earth. Top image: Aditya Laghate CC BY-SA 2.0. The most common type of muntjac is the Indian muntjac, whose females only have six chromosomes, and its males only seven — which is fewer than the lowly fruit fly, which contains eight. You might be wondering how this prehistoric pocket deer ended up with so few chromosomes, and just how it managed to survive. Truth is, while scientists have some compelling explanations for how chromosome numbers can drop during evolution, we’ve only just begun to understand why some organisms seem to benefit from reshuffling their chromosome architectures, and not just the DNA residing in each of their genes. So how did the Indian muntjac end up with just a few chromosomes, and what might this mean for our understanding of evolution? The story begins with a series of exceedingly rare events that somehow didn’t spell doom for the Indian muntjac: the sequential fusion of the majority of its chromosomes. Generally, all individuals in a given animal species have the same number of chromosomes, also known as a karyotype. Humans have a total of 46 chromosomes (23 pairs, half inherited from mom and half inherited from dad), while some mammals, like the red viscacha rat, top out with over twice that number (102). Muntjacs, depending on the species, can have up to 46 chromosomes (Reeve’s muntjac), or as few as six or seven chromosomes, in the case of the Indian muntjac. Left: metaphase chromosome spreads (karyotypes) in four mammals. a. Indian muntjac (2n = 6, 7). b. Viscacha rat (2n = 102). c. Siberian Roe deer (2n = 70 +1-14 B’s). d. Transcaucasian mole vole female (2n = 17). Graphodatsky et al. Wikimedia Commons, CC BY 2.0. Sometime during the muntjac’s long past, two chromosomes fused end-to-end in a muntjac gamete (either a sperm cell or an egg), eventually producing muntjac offspring with fewer, but larger, chromosomes. 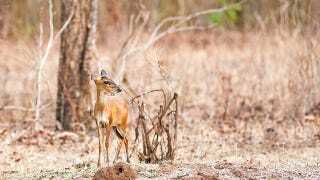 Over vast periods of evolutionary time, many of these fusions occurred and were successfully passed down, leaving the present-day Indian muntjac with a karyotype of just six or seven chromosomes. But shouldn’t such a drastic change in the organization of the muntjac’s DNA hurt the muntjac? How did muntjacs possessing fewer and fewer chromosomes survive and reproduce? Though mistakes in the inheritance of chromosomes sometimes cause severe problems (most famously in Down’s syndrome), the fusion of chromosomes can be completely harmless. According to David Ray, associate professor of biology at Texas Tech University, this harmlessness shouldn’t surprise us. In fact, chromosome fusions are found in many species, though very few animals end up like the Indian muntjac. While humans have 46 chromosomes, many of our primate relatives have 48 chromosomes. Millions of years ago, a chromosome fusion event created human chromosome 2 out of two ancestral primate chromosomes: two books, one binding. The video below, featuring Ken Miller of Brown University, eloquently explains how this fusion event makes a strong case for the common ancestry of humans and primates. Humans and chimpanzees likely diverged from a common ancestor over 10 million years ago, and humans ended up with one fewer chromosome pair, thanks to fusion, during that time. On the other hand, the ancestors of the Indian muntjac underwent twenty chromosome fusions in just one-tenth of that time. Why might muntjacs have such accelerated fusion of their chromosomes in the first place? Though we’ve known for 40 years that muntjac chromosomes arose from fusion events, the rise of DNA sequencing has finally begun to explain why so many fusions occurred. To begin with, the ends of muntjac chromosomes (known as telomeres) contain unique DNA sequences that encourage recombination, or the mixing of DNA, raising the possibility that the ends of muntjac chromosomes are “sticky” compared to regular mammalian chromosomes. A pair of chromosomes, with telomeres highlighted in pink. AJCann, CC BY-SA 2.0. Furthermore, new muntjac species keep being discovered across Asia, each with its own unique karyotype. A spate of new muntjacs were discovered in the late 1980s and 1990s in forests ranging from China to Vietnam to Myanmar (Gongshan muntjac, 1988; Giant muntjac, 1994; Annamite muntjac, 1997; leaf muntjac, 1999), an unprecedented rate of discovery for any category of mammalian species in the 20th century. Intriguingly, many of these species seem to have fused their chromosomes independently of the Indian muntjac, some making it down to fewer than ten total chromosomes through a different sequence of fusion events. It seems plausible that sticky telomeres allowed muntjac chromosomes to fuse far faster than the chromosomes of any other mammal. Beyond documenting these fusions, however, even experts like Ray — who studies the interplay between genes and evolution — can only speculate whether a chromosomal fusion event would be advantageous for a new species. Indian muntjac. Subramanya C K, CC BY-SA 3.0. Along the same lines, it’s possible that at least some of these chromosome fusions, accompanied by other types of mutations, must’ve influenced how different muntjacs acquired certain traits (for instance, the leaf muntjac is even smaller than the Indian muntjac!) But the question of whether sticky, fused chromosomes drove the success of these different muntjac species, or simply tagged along for the ride, remains wide open. Luckily, DNA sequencing continues to become cheaper by the day. And Ray, whose lab primarily studies bats and crocodiles, recently added the Indian muntjac to the short list of mammals slated to have their genomes (complete set of DNA) sequenced by the Broad Institute’s 29 Mammals Project. With the sequence of the entire Indian muntjac genome in hand, scientists may soon be able to address how the muntjac’s unique chromosome architecture spurred the development of its quirky adaptations, and how karyotype can more generally influence evolution — a topic we’ve been forced to neglect (in the absence of DNA sequencing) until now. Though genetics has come a long way over the past century, we’ve only just begun to investigate how entire chromosomes — and the entire genome (all genetic material) — change during evolution. The muntjac’s chromosome fusions, exciting as they sound, remain poorly-documented: for instance, we don’t know which genes suddenly became neighbors following these fusions, or whether further shifts in chromosome structure (figurative shuffling of DNA “chapters”) also occurred during muntjac evolution. Ray has a hunch that looking into the whole chromosomes, and whole genomes, of various organisms will finally satisfy some of our most pressing curiosities about evolution, adaptation, and behavior. One focus of his lab is the evolution of a particular family of bats, the leaf-nosed bats (Phyllostomidae). Various members of this bat family feed on wildly different things, from nectar to insects to just blood, and each has adapted to thrive on its food of choice. A vampire bat. Mark Dumont, CC BY-NC 2.0. Like muntjacs, the different species in this bat family possess unique karyotypes. By mapping different portions, small and large, of each bat’s genome to that bat’s unique traits, Ray’s lab may finally be able to address, for example, how vampire bats evolved to subsist on blood alone. The idea that the location of genes on chromosomes might be just as important as the content of the genes themselves isn’t new, but sequencing will finally allow scientists to test whether these ideas are correct. Indeed, scientists increasingly argue that big changes to chromosomes may play a larger role in evolution than small mutations to individual genes. (Individual genes rarely turn out to control singular traits). Though evolution in mammals is tricky to study in the lab, and even in the field, scientists have recently been able to show that large chromosomal rearrangements can drive evolution in yeast, and that karyotype shifts (like those caused by chromosome fusion) can promote diversification in butterflies. The funky karyotype of the Indian muntjac will probably keep scientists happily busy for quite some time, but scientists like Ray are poised to advance our knowledge of evolution in leaps and bounds as more species are completely sequenced. And who knows, maybe this research will someday provide a better explanation for the few of us humans who have managed to survive a chromosome fusion. Regardless, I can’t wait to someday meet a barking, dog-sized deer with fewer chromosomes than a fruit fly.